Home | Blog | Uncategorized | Winter Activities in Chamonix (other than Skiing)! Winter Activities in Chamonix (other than Skiing)! The Chamonix valley is famous for its extreme skiing and attracts many winter sports enthusiasts throughout the season. However, Chamonix is more than just a ski resort, it is a beautiful historical mountain town with an eclectic mix of things to do off of the slopes as well. If you don’t ski or if you simply fancy a bit of a break from the piste for the day, the world is your oyster! The Montenvers traditional rock and pinion railway line, opened in 1908, and runs all the way to the spectacular Mer de Glace, which is the largest glacier in France. The Gare de Montenvers is just behind the main Chamonix-Mont-Blanc station, you can access it over the railway bridge. When you arrive at your destination you can take a cable car right to the heart of the glacier, where every year an ice cave/grotto is carved into to glacier. Take note though, that to get there and back you will have to descend and ascend 430 steps, so it is not for the faint hearted. One of the highlights of the trip will be the viewing platform with a perspective over the glacier and Les Drus the impressive mountain peaks. It is best to take the trip on a clear, blue sky day. 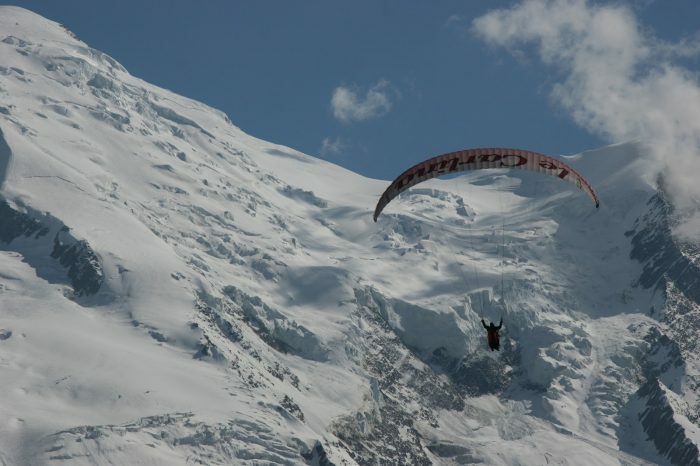 In the town of Mieusey, just 50km West of Chamonix, the sport of paragliding (Parapente in French) was born in 1974. The sport is now hugely popular and Chamonix with its steep peaks, glaciers and strong thermals (caused by the huge temperature change between night and day in the valley) is one the main mountain flying hubs. To experience the euphoric feeling of soaring above the mountains like a bird and to feel the wonder of those sky high views, you can take a tandem parapente with a fully qualified instructor. 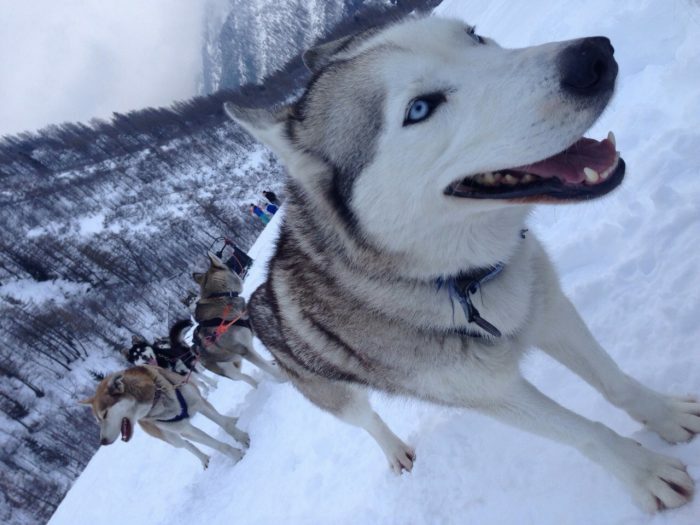 Enjoy a day leading your very own sled of husky dogs through snowy forest trails, being taught how to start, steer and stop and not let go by an instructor. Or if you would prefer a more relaxing few hours, you can simply be a passenger on the sled, enjoying the traditional Nordic experience, whilst taking in the beautiful Mont Blanc Massif scenery. Not just for the experienced alpinist, this exciting activity can be tried out by even a novice climber. Though a bit of knowledge on ropes and some climbing skills will be an advantage, the experienced instructor guides will be able talk you through everything. Beginners can start off at La Cremerie, in Argentière, where there are lots of easy routes and can progress to climbing some of the most beautiful frozen waterfalls in Chamonix. There are over 200 routes for varied levels and skills throughout the valley. This winter activity is a great way to get out into nature, have a bit of exercise and soak up the breath-taking views of Chamonix. Chamonix has a multitude of different snow shoe trails ranging from beginner level, right through to advanced. You can simply head to any of the many sports shops in town and hire a pair of snow shoes (Raquettes in French) and poles for a reasonable price, pick up a trail book, and head off on an adventure. Guided snow shoeing tours run throughout the valley, so should you wish you can see some of the more hidden gems in the mountains with your expert guide leader pointing out the sights. The torch-lit evening dinner walks come highly recommended. You can wander through the crunchy woodland snow underneath the moonlit sky to dine in a traditional Savoyard restaurant. This traditional wooden sled ride down the home piste of Grands Montets is guaranteed to fill you with adrenalin and provide some hilarious stories for the dinner table. You ascend the last lift up to Grands Montets with your guide and then are able to whizz down the slopes, trying not to tumble too much, with no body around to get in your way. It is very reasonably priced, perfect if you have a free afternoon. Soaring 3842 metres into the sky, this majestic pinnacle must be visited if you are in Chamonix. It can be accessed by the telepherique in Chamonix sud. In the winter season it is advisable to book your ticket in advance as it gets very busy. Take note that there is no point in taking the trip if it is cloudy as you will not be able to see anything, but also be aware that it could be completely clear at that altitude even if the valley is in thick cloud. You can check the webcam at the summit to make sure www.compagniedumontblanc.com. All of the viewing platforms at the top station offer spectacular panoramic perspectives of the surrounding mountains and of course the breath-taking Mont Blanc. On a very clear day you can see the alpinists beginning their challenging ascent. There is a café at the top station to sit and enjoy a beer or snack at altitude and a museum displaying mountaineering and alpinism exhibits. On a clear day you can often watch the Wing suit flyers taking off from the top terrace, plunging down into the valley at astonishing speeds. Arguably the best way to view the stunning Mont Blanc Massif in a completely safe environment is via a helicopter ride. Soar 3000m into the sky around Mont Blanc, drink in the dazzling glaciers and sensational panoramic and be back down in the valley, all within 30 minutes. You can take your pick of routes to enjoy and the helicopters are able to seat up to 6 passengers. There is truly no better way to relax than by reclining in a melting Jacuzzi surrounded by snowy mountaintops. Hôtel Les Aiglons in Chamonix Sud has the most reasonably priced spa facilities accessible to the public. You can enjoy beautiful views of the mountains from the Jacuzzi, take a swim in the heated pool, or lounge in the hamman or sauna cabins nearby. The Park Hôtel Suisse also offers spa facilities to the public. If you should wish to venture a little further, Les Thermes in St Gervais, just outside the valley are a bit more expansive whilst remaining close to home. Driving the other way into Switzerland through beautiful surroundings for about 40 minutes you reach Lavey-Les-Bains, the impressive Swiss spa complex, where you could quite easily lose several hours in blissful relaxation. Chamonix is full of other things to do, you just need to find the time to squeeze them all in during your week away. There are several outdoor patinoires, in Argentière, Les Houches and Vallorcine, as well as an Olympic size rink in the centre of Chamonix sports centre complex. This Olympic rink is home to the Chamonix ice hockey team who play home games almost every 2 weeks. It is definitely worth catching a game if you can, there is a great atmosphere and it is very exciting if you have not watched ice hockey before. There is a bar in the stadium and you can even purchase a hot dog. The kids will love it. Chamonix has its very own cinema, Le Vox, located just opposite the post office in the town centre. They play certain films a week in English and also show some interesting alpine and sports films that you would not be able to see elsewhere. The bowling alley is also well worth a visit if you are stuck for something to do with the family in the evening, you can even bring your own pizza in from the takeaway across the road. Chamonix is a hub for climbing and boasts 2 indoor climbing centres that definitely merit a visit, if this is up your street. The Mont-Blanc Escalade in Les Houches has over 120 routes as well as a small bouldering area and the guys who run it are constantly creating new courses. If you would prefer to just boulder there is a decent sized bouldering gym in the sports centre complex in Chamonix, that has a very reasonable €5 entry tariff. The market at Place du Mont Blanc, in the town centre, takes place every Saturday morning and trades a wide variety of delicious local specialities, cheeses, saucisson and fresh produce and is well worth the excursion. That is if you can find the time amongst the many other activities packed into your week!